In the ever-expanding world of digital currency, Ethereum is one of the most promising technologies on the market. Ethereum’s rapid growth has transformed paupers into millionaires. But despite its skyrocketing value, very few people actually understand what Ethereum is or why it's a good investment. For those of you who don’t know what Ethereum is, it's important to understand that it's much more than just a digital currency. Ethereum is an open-source, public blockchain-based computing platform. What this means is Ethereum is often used as a platform to develop groundbreaking applications (called dapps). And the digital currency allowing those applications to operate is called Ether. If you buy Ethereum, you're actually buying Ether. But in the investing world of digital currency, the terms Ethereum and Ether tend to be used interchangeably. As a whole, digital currencies have a lot of selling points. Many digital currencies use blockchain technology and finite market caps. These digital currencies are hyperinflation-proof, free from big banks, and open to the individual. That being said, blockchain technology is certainly one of the key selling points behind digital currencies. Bitcoin was the first coin to ever operate on a blockchain network. Every transaction that takes place on Bitcoin's blockchain is recorded in a "block." This block is then attached to a long chain of blocks. Ethereum is written in Turing-complete code language. For a computer to be Turing complete, it must be capable of running any algorithm. Because of Turning-complete language, any script can run on Ethereum. Ethereum's blockchain records things far more rapidly than Bitcoin's — processing transactions in 12 seconds, as opposed to Bitcoin’s 20 minutes. This makes Ethereum's blockchain the best network to support any business or program. Its ability to solve problems with accuracy and precision has no rival. Ethereum’s speed and ability to act as a platform for dapps has attracted the attention of dozens of companies, all of which are vying to be the first to use and potentially profit from Ethereum's blockchain. This brings us to our next point: hundreds of major companies have Ethereum’s back. One of the strongest pieces of evidence for Ethereum’s long-term prospects is the Enterprise Ethereum Alliance (EEA). In February 2017, multiple major companies — including dozens of Fortune 500s — decided to collaborate on furthering the Ethereum network technology, with the goal of incorporating it into their businesses. This group includes companies like Intel, Microsoft, JPMorgan, BP, and Thomson Reuters. Now in 2018, the EEA is over 200 members strong. These companies don’t take risks lightly. They have maneuvered their ways to the top through brilliant executive decisions and by continually developing business models. 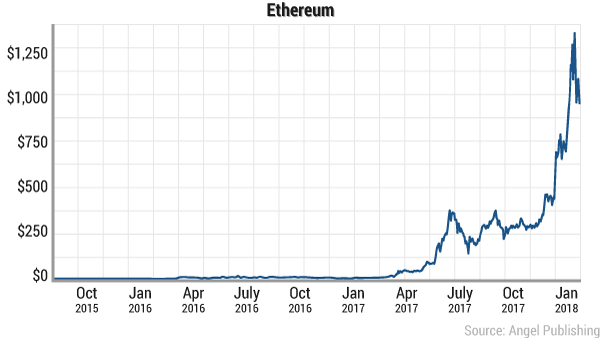 Ethereum spiked sharply after the EEA became public, touting big names like lollipops for hungry investors. These companies want Ethereum for dozens of reasons. They want the platform for its speed and efficiency, but they also want the Ethereum network for its ability to execute smart contracts. For those of you who are unfamiliar with smart contracts, know it's a contract in the code that dictates action. Take this example: In the physical world, you have an agreement with your sibling that if you hit them, they get to hit you back. If you throw a punch, they may retaliate. Now, say this interaction was happening in the code world. A smart contract receives the first transgression (you punching your sibling) and then executes the appropriate reaction (your sibling hitting you back). You need smart contracts to move things along efficiently. And for a blockchain network, they are invaluable. Ethereum’s creator, 23-year-old developer Vitalik Buterin, developed Ethereum to work with smart contracts. Before he created Ethereum, Buterin was heavily involved with Bitcoin and blockchain. He realized early on that Bitcoin’s inability to process smart contracts was a major shortcoming of the currency network. Ethereum’s network possesses something called an Ethereum Virtual Machine (EVM), which processes smart contracts and makes charges or decisions accordingly. The EVM would rapidly speed up business processes and increase efficiency across the board. Every action that happens would receive the correct response immediately. It doesn’t matter if it's a payment, transaction, demand, etc. And in the business world, efficiency is money. That's why you see so many trendsetters in the EEA. These companies have CEOs who have predicted trends time and time again. They know that by being an early mover and incorporating this kind of technology, they have positioned their companies for potential monumental growth down the road. In fact, over the course of 2017, investors flocked to any company associated with the word blockchain. Many of these companies, of course, are probably not properly using blockchain technology. A good example would be a division of Hooters restaurants, which released a digital currency-based rewards program that operates on blockchain. However, if you can find the right companies working with blockchain technology — particularly Ethereum and other advanced blockchains — then those companies could be a good bet while blockchain technology continues picking up speed. Currently, not many technologies are as well-positioned as Ethereum to be adopted by institutions. And this adoption is starting with the institutions that digital currency could potentially destroy: banks. Bitcoin is a bit of a villain in the banking community. It poses a threat to our current monetary system — a threat that gives it a lot of value in the eyes of many individuals. But banks look kindly on the Ethereum network, which will allow them to thrive in our increasingly digital world. Bank of America is the first financial institution to work with the Ethereum blockchain. The company premiered an Ethereum-based application that will help customers in securing their transactions. This application was created with the help of Microsoft and with the goal of speeding up the mainstream adoption of Ethereum technology. The application packages customer information into blockchain packets that can only be accessed by the private parties involved in the transaction. This prevents the information from being emailed out, which eliminates multiple privacy concerns. But both Bank of America and Microsoft want the application to be more than a security resource. It has to be a pioneer, winning the trust of the public. This will be one of the first Ethereum-based applications that everyday consumers will interact with. Technology adoption happens slowly and often without consumers knowing it. When consumers upgrade their MacBooks or buy new iPhones, they're being guided by Apple to adopt new technologies. Many are expecting a similar thing to happen with Ethereum blockchain, which will be slowly incorporated by big companies and then trickle down to their clients and customers over time. But big companies that push mass adoption will give Ethereum a leg up on other technologies. There's no denying that Ethereum is a powerful technology with the potential to further not only businesses but also our global currency system. Currently, the most popular digital currency exchange is Coinbase. Coinbase allows investors to buy Bitcoin, Ethereum, and Litecoin. In the future, there may be more promising digital currencies added. When you sign up to Coinbase, you can pay with your bank account or credit card. Now, if you choose to not use Coinbase, there are many other digital currency exchanges out there. Just be careful and do your research. With the digital currency gold rush has come digital currency crooks. And there are fake exchanges out there that will take your payment and never provide you with the promised coins. The best way to check is to look at the website's domain name. If it doesn't have "https" in front of the name, do not invest. This website isn't secure and encrypted. And more than likely, it's a scam.